The Would Be Donald Trumps Are Everywhere! – Accurate (Peel) Appraisals Inc. The provincial government is talking about imposing a speculators tax. Perhaps as the Scottish philosopher & economist Adam Smith indicated, things should be left to the invisible hand of the market place. Several verifiable sources have repeatedly indicated that at least 1 in 5 brand new homes are not closing. If prices continue to adjust, this may be just the tip of the iceberg, especially in perspective to the plethora of upcoming condo closings. The services of a professional appraiser could prove invaluable regarding any future discussions with a builder or developer. Please refer to the Globe & Mail article below by Shane dingman, and Youtube video links regarding Bank Lending and Real Estate Liquidity with Martin Armstrong and Speculative Investment Inflated Toronto Housing Bubble. A couple walks into an open house in the Etobicoke area of Toronto on June 15, 2018. Amid the signs of recovery in the Greater Toronto Area’s real estate market after a difficult year, there’s an odd signal that things are still changing: There are many more vacant detached houses for sale than there were at this time last year, particularly in the suburban 905 communities. John Pasalis, president of Realosophy Realty Inc., got curious about the number of showings he’d been to in recent weeks where the properties were listed as vacant and ran a snapshot analysis of all the current active listings in the GTA. Out of about 19,000 active listings in the region as of mid-August, according to Pasalis, 28 per cent were listed “vacant,” a 17-per-cent increase from the same time in 2017 where only 24 per cent of 17,600 active listings were labelled vacant. Toronto and York Region are the GTA’s two largest markets, sharing about 29 per cent of all active listings, Halton Region has 10 per cent, Peel 19 per cent and Durham 12 per cent. According to his analysis, there are 5,500 condominium listings in the region with a vacancy rate of about 35 per cent, a share similar to 2017’s condo vacancies. While Mr. Pasalis expected the boost in vacant listings would have been caused by investors flipping condos, the faster growing share of vacant listings turned out to be detached homes: Low-rise house listings now have a 25-per-cent vacancy rate, compared with 19-per-cent vacant in 2017. 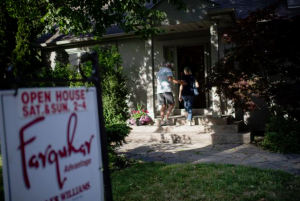 The growth in detached vacant listings is being led by the surburban 905 communities: Vacant house listings are up 47 per cent year-over-year in Halton, 17 per cent in Peel, 32 per cent in York, 37 per cent in Durham and 23 per cent in Toronto. There are also more detached sales in the 905 then there are in Toronto: In the Toronto Real Estate Board’s July, 2018, market report, there were 672 detached home sales in Toronto, compared with 2,390 in the 905. Data provided in TREB’s market watch reports back up that impression. Selling volumes for detached homes in the 905 (excluding semis and townhouses) began falling fast in April, 2017, and selling prices have averaged lower every month (on a year-over-year comparison) since August, 2017. The peak price decline months didn’t come until in March and February, 2018, when prices fell 17.9 per cent and 17.8 per cent respectively as sales volumes were 47 per cent and 43 per cent lower. However, beginning in June, 2018, the negative sales volume trend finally stopped in the suburbs: 5.3 per cent more detached homes were sold than in 2017, and the average selling price was only 1.8 per cent lower. In July, 28 per cent more homes sold in the 905 than in 2017, and the average price was just 0.1 per cent lower. That said, the sheer volume of sales for the 905 remains far off the highs of June, 2016, when 4,816 detached homes sold; there were 2,704 detached homes sold in June, 2018. He hasn’t noticed a dramatic uptick in vacant houses, but where he has seen a house sit empty for sale, it’s often linked to mispricing. One detail that surprised Mr. Pasalis: there wasn’t a particular price segment more prone to vacancy. “I thought it would be higher-end homes, or mainly higher-end homes, but it was relatively in-line with the distribution of house prices for the whole market. There wasn’t any outliers,” he said.